retraction (re-trak'shun) Moving a part backward (pulling the chin backward). elevation (el"e-va'shun) Raising a part (shrugging the shoulders). depression (de-presh'un) Lowering a part (drooping the shoulders). Where movements of body parts are part of the definition, we will simply describe movements of those parts, for example, adduction of the lower limb or rotation of the head. Special cases also fall herein, as with plantar flexion of the foot. Other movements are de scribed by the change in geometry at a joint, such as the action of the biceps brachii, flexion at the elbow. Here we will go with the more descriptive "flexion of the forearm at the elbow." Table 8.2 lists information on several joints. H Name six types of synovial joints. ^9 Describe the structure of each type of synovial joint. ^9 What terms describe movements that occur at synovial joints? Joint movements illustrating adduction, abduction, dorsiflexion, plantar flexion, hyperextension, extension, and flexion. The shoulder, elbow, hip, and knee are large, freely movable joints. Although these joints have much in common, each has a unique structure that makes possible its specific function. The shoulder joint is a ball-and-socket joint that consists of the rounded head of the humerus and the shallow gle-noid cavity of the scapula. The coracoid and acromion processes of the scapula protect these parts, and dense connective tissue and muscle hold them together. The joint capsule of the shoulder is attached along the circumference of the glenoid cavity and the anatomical neck of the humerus. 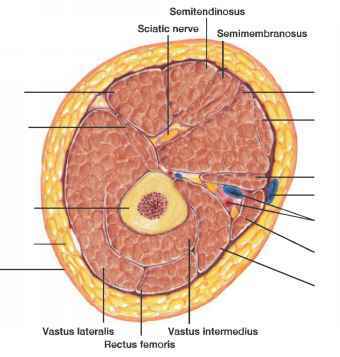 Although it completely envelopes the joint, the capsule is very loose, and by itself is unable to keep the bones of the joint in close contact. However, muscles and tendons surround and reinforce the capsule, keeping together the articulating parts of the shoulder (fig. 8.13). The tendons of several muscles intimately blend with the fibrous layer of the shoulder joint capsule, forming the rotator cuff, which reinforces and supports the shoulder joint. Throwing a ball can create powerful decelerating forces that injure the rotator cuff. 1. Coracohumeral (kor"ah-ko-hu'mer-al) ligament. This ligament is composed of a broad band of connective tissue that connects the coracoid process of the scapula to the greater tubercle of the humerus. It strengthens the superior portion of the joint capsule. 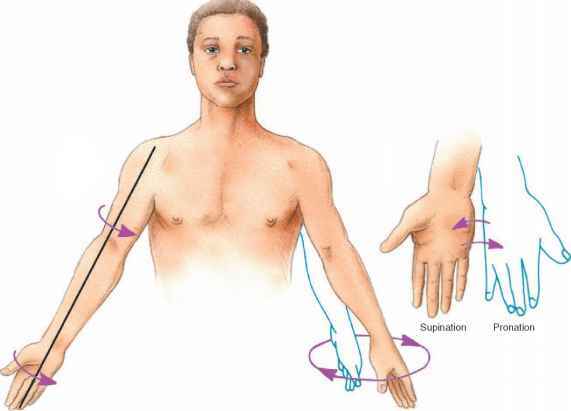 Joint movements illustrating rotation, circumduction, pronation, and supination. 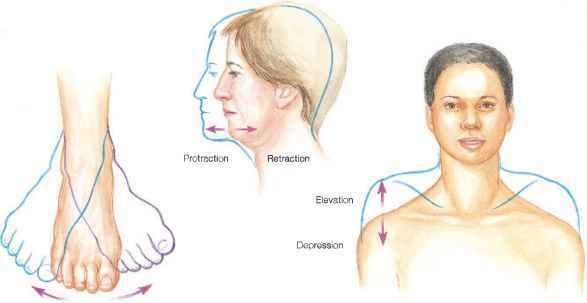 Joint movements illustrating eversion, inversion, protraction, retraction, elevation, and depression. What bones are used in shoulder abduction?